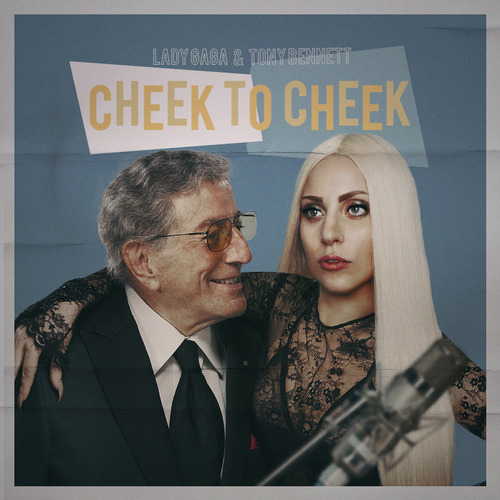 “Cheek to cheek” is a collaborative album by american singers Tony Bennett and Lady Gaga, released on September 19, 2014 through Interscope Records and Columbia Records. Bennett and Gaga first met backstage in 2011, after performing at the Robin Hood Foundation gala in New York City. The two later recorded a rendition of “The Llady is a tramp”, and began discussing plans for working on a jazz project. “Cheek to cheek” consists of jazz standards by popular jazz composers like George Gershwin, Cole Porter, Jerome Kern and Irving Berlin. The album was inspired by Bennett and Gaga’s desire to introduce the songs to a younger generation, since they believed that the tracks had universal appeal. Necessary album for everybody. And for Gaga, more than ever. She shows she can do other things, and the fact that she’s -with other things aside- a real good singer. And for Bennett is just simple: oldie sound of suit & tie and success. Really good example made by Lady Gaga for her fellow pop-scene peers. Esta entrada fue publicada en Jazz, Music in english y etiquetada &, +, 320kbps, Amazon, American, Artist, Audio, Available, Channel, Cheek to cheek, Collaboration, Columbia, Company, Cover art, Crítica, Download, Duo, Fandom, Feat, Featuring, HD, Imprint, Interscope, iTunes, Jazz, Label, Lady Gaga, Lady Gaga & Tony Bennett, Little Monsters, LP, Miguel Maestre, Mother monster, New album, Opinion, Out now, Recommendations, Records, Release, Review, Singer, Single, Song, Soundcloud, Spotify, Stores, Style, Suscribe, Tony Bennett, Track, TTM, X, YouTube. Guarda el enlace permanente.